It has been a tradition for me and my travel buddy Claire, to organize an event for ourselves, our friends and to our friend's friends. This has been the venue for us to meet new friends and future travel buddies. A little trivia, I met Miss Lingayen thru our organized Christmas Dinner last year ;) For this summer we decided to organize a trip in a beach not that far from Manila but far enough to feel that we went out of town for vacation. 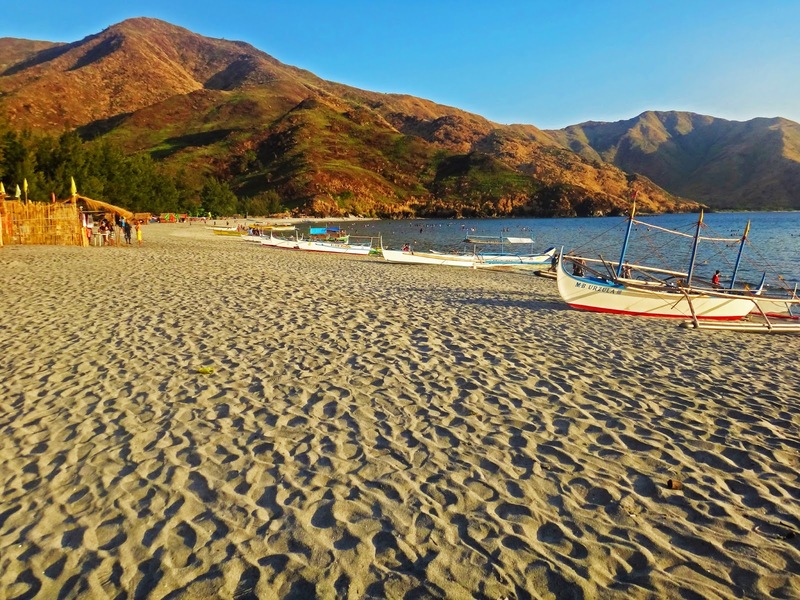 We decided to experience Nagsasa Cove in San Antono, Zambales even before the sun explode for its summer heat. Since me and Miss Lingayen went to Talisayen Cove last year, I now have a contact in Pundaquit, San Antonio that organized boat transfers, island hopping and meal for a minimum number of participants. Miss Lingayen and Claire helped in the marketing, I mean inviting friends while I did all the logistics and planning for the trip. Well I guess this is I am good at... hehehe... Claire took charge of the activities during the event. Sixteen travelers met in McDonald's, Panay Ave where the chartered van I hired was waiting for us. Some of us met for the first time - although we have common friends in the group - so the excursion was a good way of getting to know new friends! While some were chatting and other were eating me and Claire paired them, those that were strangers to each other, and gave them an assignment to get to know their new 'travel buddy' for the night's activity. We reached Pundaquit in San Antonio Zambales at around 5:30AM to meet the boat owner. Travel time from Manila to San Antonio took 3.5 hour. At around 7AM we boarded the 20pax boat for Island hopping in Camara Island and Capones Island. We were ushered by our boatman to the white sand coast of Camara Island. Gigantic rock formations welcomed us as we soaked or feel into the salty water and in a not so fine white sand of Camara. Its a refreshing feeling whenever you walk barefoot on the sand while wave tickles you. Good thing is, as I have said the sand is not fine so it massanges your feet when you walk on it. After some minutes of picture taking in Camara Island our boatman warned us that our boat cannot dock on the shore of Capones Island because the tide was low. Aside from that he said that the current in Capones Island was strong because the area in which the boat will dock for the lighthouse faces the open sea. The tide was low yet the current was strong.... hmmm conflicting. Anyway, when he saw that most of us were persistent to see the lighthouse he suggest that we swim from where the boat can stop up to the shore. Well, he challenged, he better be sure about that - we all wanted to see the lighthosue so we all decided to swim. Upon reaching the area where the boat will dock for the Capones Lighthouse, it was clear that boats can dock on the shore that is enough for us not to be scared to swim. Big pebble rocks welcomed us in Capones Island. Since me and Miss Lingayen have been to Capones last year, we opt to stay in the cliff and be mesmerized by the sea. Some joined us in the epic selfies in the cliff white others proceed to the lighthouse. Nagsasa is suppose to be 1 hour boat ride from Capones but becuase our boat is big, as per our boatman, we traveled to Nagsasa Cove for about 1.5 hours. That was nothing when the Zambales Peninsula mountain range on your left side will magnetize you. We arrived in the cove at noon in time for the intense heat of the sun. We all first sheltered in a cottage reserved for us while the our boatman and other staff prepared for our lunch. Some stayed in the cottage while chatting, some took a nap and others explored the beach - I took a nap on the sand feeling the hot humid from the sea and the cold wind from the forest of agoho trees. Later that afternoon before sunset we explored the outskirts of the island passable to man. We passed by rivers and open fields leading to the beach font. What makes Zambales more more appealing aside from the unique mountains are the presence of agoho trees - a variety of pine trees. The long walk was breathtaking and stunning. If my camera could speak, he would say he's tired of the numerous clicks I made for the same spot. No one can blame me, everything is picturesque! The land seems barren that it cannot be cultivated for rice or fruit bearing trees. If so, Nagsasa is a beautiful barren existing only fascinate the people. Now that is a beautiful purpose. I had a theory that maybe after the eruption of Mount Pinatubo in 1990s the land was covered by significant amount of ashes that made Nagsasa what it is now - barren but beautiful. There are some tick portion of sand visible when we were crossing the river that leads to the sea. Nonetheless it was nature's way to create an environment not suitable for vegetation but alluring to man's eye. When you are in a beach its almost an expectation to have a bonfire by the shore. Who wouldn't want to feel some heat while embracing the cool air from the sea? With some hotdogs, marsh mallows, some liquors and some good laugh can turn the night into a party. I had some hesitation if we will push trough with the bonfire simply because it is not environmentally friendly. I contemplated for a long time before we made the trip and later on decided to push through with it with extra precaution. The burned particles and ashes made by the fire should not go to the seawater, I asked our guides to place the bonfire away from the shore and I made sure that t will be cleaned the next day. Part of the plan was to have an intimate activity before we go wild in the night. Since Claire is a professional facilitator, she led us to have fun night then later on interact with our travel buddy. First, we had a game called Fish and Net where in you have a two shoals. The longer shoal is the net while the shorter shoal is the fish. I wont go too far with the mechanics... its secret...better join us next time for you to know. After the ice breaker its time to introduce our "stranger travel buddy" Remember the assignment that we gave in McDonald's? Now each partner will introduce his or her partner to the group assuming that they had a bonding or at least interact during the day. Most had an interaction with his/her partner and the good thing was everyone cooperated and said a lot of things about his buddy. I prepare some marsh mallows and cookies for us to make some s'mores. The things was, the s'mores that we will make is not for us but for our buddy! It gave us more chance to get to know the taste of our buddy based on how we cook for him. It took me the 3rd time to make perfect grilled marsh mallow for my buddy. During the night while they were playing I realize how magnificent the sky during the night. I did some refection while staring above looking at the thousand stars 1 million lighyears away from me. Bad thing was I did not have pictures because I am too amazed to lift my heavy camera. The hike was like less than 30 minutes including the photo ops while ascending. Aside from staring and shuttering one cannot help but to speak out how stunning the view is. You will jump for joy and only happiness and gladness will reign in your heart simply because that morning, with the hang over from last night, you woke up early and you saw God's magnificent creation. After the hike and some heavy breakfast we hit the beach again for sun bathing. 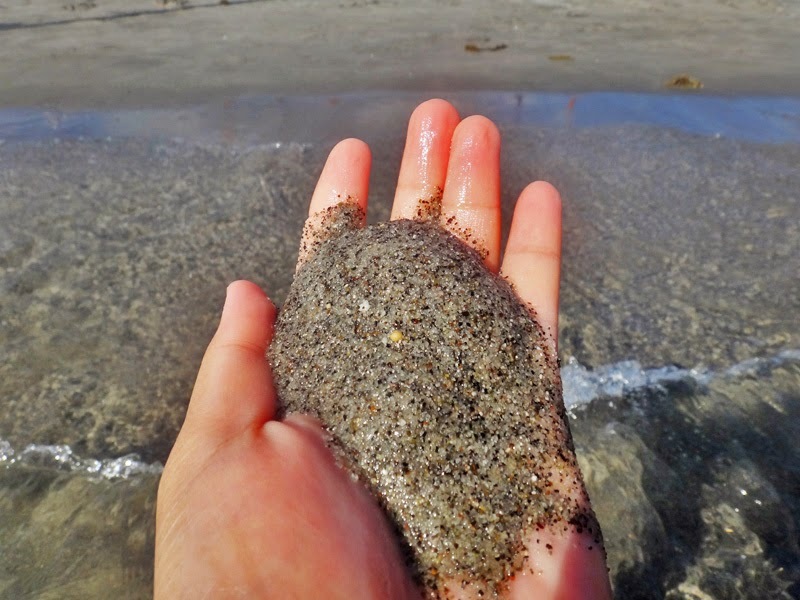 The sand in Nagsasa Cove is not white - its ash - but fine enough for a good beach experience. Actually if you look closer there are a lot of colors that made up the sand - white, yellow, orange, red, green and even black. We went to the other side of the beach opposite from where the hill is located. There is a large rock that leads to a secluded beach called Hidden Spring. That beach is accessible only by boat. Other option is to swim and to boulder on the rocks - and we did those. We are sixteen travelers stranger to one another. We braved the night and the stigma - don't talk to strangers - to have a memories which we can treasure forever. 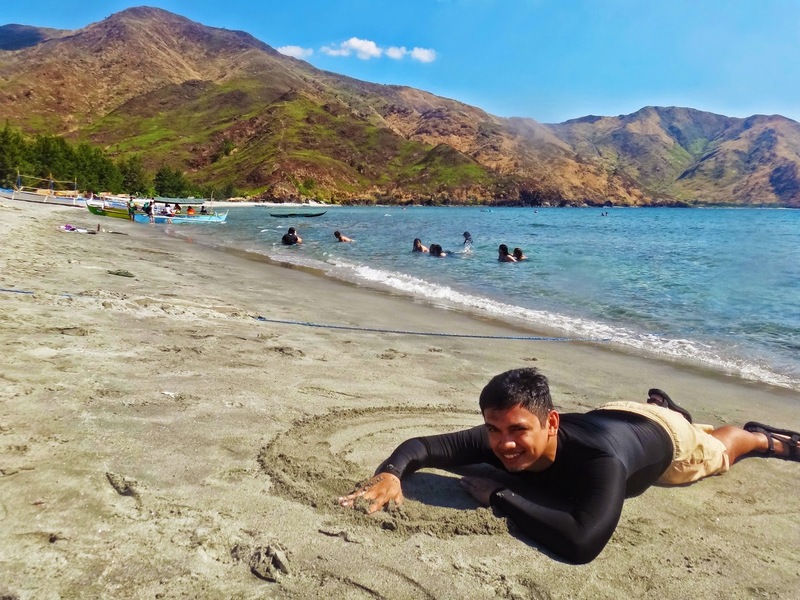 We went to Nagsasa Cove with expectation to be merry and gay - and we were. I myself wants to go back because Nagsasa Cove is worth the time, effort and money. Saying goodbye to Nagsasa... see you soon! Because we were in Zambales I took the opportunity to tour the group in the Ancestral House of President Ramon Magsaysay. Considered as the most well-loved president ever, Pres. Ramon Magsaysay born and raised in Zambales. The Ancestral House of President Ramon Magsaysay is located along the main highway in the town of Castillejos. There is no entrance but they are accepting donations. From Cubao, take a bus bound to Iba or Sta. Cruz, Zambales. Fare is Php250.00. Travel time is 4 hours depending on the time of your departure. Tell the driver to drop you in San Antonio. There is a 7-11 and a sharp curve towards Sta. Cruz. In San Antonio, take a tricycle bound to Pundaquit. Fare is Php100 - Php150. Travel time is 10-20 minutes. Pundaquit is the jump-off to the three coves in San Antonio as well as for Island Hopping. Upon arrival expect a lot of boats offering a ride. The tricycle driver from Pundaquit may help you find a boat bound to Nagsasa.